I am still impressed with Shopify, but when I logged in recently to my Shopify account, I saw that Shopify’s “blogging” functionality is weak. Very weak. When I saw that there was an app to import a WordPress blog into Shopify, I laughed, and went ahead creating a Shopify importer for WordPress. The Shopify Importer plugin is designed to make blogging about each of your products simple. Export your products from Shopify (Go to Products, click on Export Products, then Export all products). This will save a CSV file to your computer. 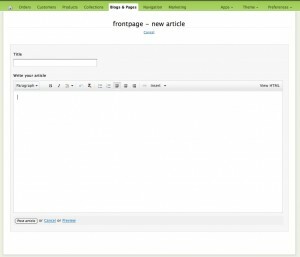 In WordPress, go to Tools > Import. Click on Shopify. When products are imported, the tags are converted to WordPress tags, vendors are converted to categories (if selected), and all the product information is stored as a Custom Field for the post or page. There are plans to expand the plugin to add additional functionality. What would you like to be added to the plugin? Off course! 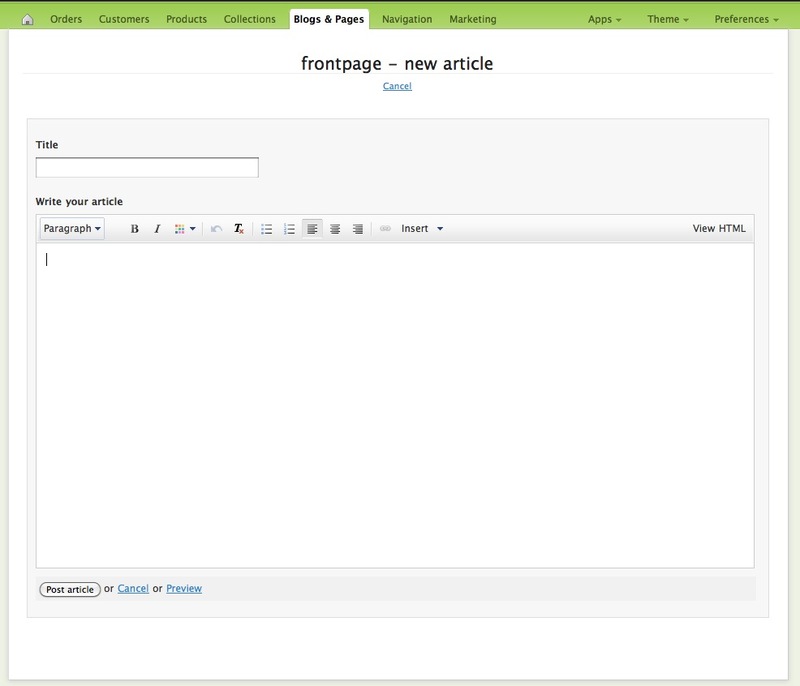 WordPress bangs for its beautiful themes. do you have an example of how this looks once complete? sounds intriguing, but i’m having a hard time picturing how it works. and does it automatically update when you add more products to shopify or do you have to keep exporting/importing? For now, it just creates a post (or page) for each product that has the title of the product name, custom fields for all of the data, and tags for the product tags. You would need to keep exporting and importing. I created this plugin to gauge interest in a far more integrated offering for the Shopify world. @Matt Does Shopify not allow custom titles or meta? Really? @ Colorcodz I agree. A plugin that uses a widget with short codes to pull in Shopify product is needed for anyone working with Shopify and wordpress. Kinda surprised that it’s not available already? Does anyone have any creative solutions for this? Examples? @Zack is this functionality something that you have looked into? Curious about how simple/difficult it would be to have this type of plugin built. I would really like to see an option for import as custom post types. Blog posts are fine if you are, well…, blogging about your products. I am moving away from shopify completely because its complete lack of basic SEO control such as custom page titles and meta descriptions. I may be looking at wp e-commerce solutions. I can’t get the shopify import to wordpress to work. The products exist in shopify. The CSV is correct (even though I took out some of the fields). The instructions track, but nothing happens. I get an empty wordpresss file saying, in part, I may have to adjust my ini.php – which I can’t find at my hosting server. What can I do? I don’t see anywhere that let’s the person actually add the product to the cart in the custom fields. How would I do that in the Custom Field? The URL to the product images is saved as a custom field. Love it – can you also add functionality to import the pages – there is NO way to backup shopify pages, and this would be be a godsend. Hi, I’m looking to transfer the content from our shopify blog to a new wordpress blog. We don’t really need our product info transferred, just the content from our blog. Can this app do this? Thanks in advance. Thanks Zack. Appreciate the quick follow up. Any thoughts on how we could transfer our blog content more efficiently than copy and pasting? Is there a way to cause this import to import as products into WP ecommerce? That would be awesome. That’s a good idea. I’ll look into it. I just tried to use this plugin and it didn’t work. There was no content on the pages and they all said “No Title”. I can get my product to display on my Worpress “Shop” page, but its simply an image of the product. How can I set it so that the imported product is also linked to my shopify shop? Seems pretty useless to me unless I am missing something. I was able to import my products but they were not imported as something that could be purchased, merely a blog post on the site. My guess is that I would have to manually go in and create a link to every post for the actual product that would then divert them to the store. Is this right or am I missing something here? The meta-data is imported for each product as well, and can be accessed by a developer. I’m actually looking to shut my shopify shop but I want to retain the blog. Can I use your tool to migrate my Shopify Blog to WordPress? I appreciate how fast it imported, but when POST was mentioned and they came in a PAGES without categories, that is not a happy thing. Also, associated image if available and link to “buy” on shopify would be REALLY helpful, since at this point, I’ll have to try to import again as POSTS with categories and then go in, add each image and link. Saved some time, but not much. Duoh, found the checkbox that chose pages. Sorry about that. Back to the image and link. Those would be helpful, but you saved me a TON of time for an artist friend. Thank you. Love the update feature, too. Next Next post: Want some valuable .gov links? Get a FDA warning letter!